Floral arrangements are always a great way to brighten up a house. Even more fun when they have Snoopy on them Check out the Snoopy house arrangement from Teleflora. Snoopy! He’s the Flying Ace, Joe Cool and Charlie Brown’s beloved beagle and confidante. An ode to his decorated doghouse from the TV special, this holiday bouquet is a collector’s dream. “A Charlie Brown Christmas” is the first animated television special based on the popular newspaper comic strip, Peanuts by Charles M. Schulz, and the first Christmas special for the franchise. This December will mark the 50th anniversary of the Emmy-winning special, which first premiered in 1965. It was produced and directed by Bill Melendez, who also supplied the voice of Snoopy; and Executive Producer Lee Mendelson. The synopsis: ‘Tis the season to be jolly, but Charlie Brown, feeling that Christmas message is lost amid all the seasonal glitter, has the blues. Psychiatrist Lucy suggests a cure: get involved with the Christmas play! When our hapless hero sets out to find a Christmas tree to use as a stage prop, he unknowingly takes a step toward discovering the holiday’s true meaning. The scraggly tree that thrives on a “little love” and a timely assist from Linus make the message of the season come shining through. The TV specials air on the ABC network leading up to the Christmas holiday. Featuring the frisky beagle himself asleep atop his iconic red doghouse, the FDA-approved container doubles as a cookie jar for storing Christmas (or canine) cookies for seasons to come. Rich red and white blooms complete with greens, pinecones, and holiday ornaments make the perfect gift for your most cherished and loyal friends and family. You can easily put a smile on someone’s face this Christmas with a special arrangement. Simply place an order for any beautifully-arranged floral gift, hand-crafted and delivered by a local florist anywhere in the country, visit Teleflora online and place your order today. 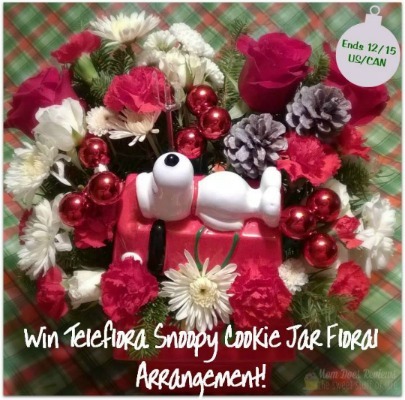 You have the chance to beautiful Snoopy’s House Cookie Jar arrangement from Teleflora! The giveaway ends on 12/15/15 at 11:59pm EST. 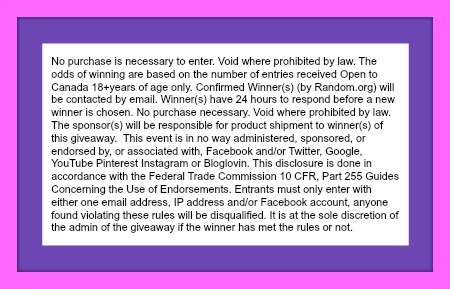 Simply follow the Rafflecopter entry form below for your chance to win. Be sure to return tomorrow to complete the daily entries. I love the snoopy mug arrangement. I would like to try Teleflora’s Mercury Glass Bowl Bouquet! i like the sparkling winter wonderland arrangement the best. Love the Make Merry arrangement! Make Merry is a perfect centerpiece, not too big and not overwhelmed by the table. Or the Snoopy cookie jar! My favorite is definitely the Snoopy Doghouse arrangement. I love the Snoopy’s Cookie Jar by Teleflora. That is so cute and brings back good memories. I love the sparkling winter wonderland flower arrangement! I like to try the Teleflora’s Silver And Joy Centerpiece, but my favorite is the Snoopy cookie jar floral arrangement! The Sparkling Winter Wonderland is very pretty. I love the Teleflora’s Silver And Joy Centerpiece. its so beautiful! I love the Snooky Cookie Jar! I also like the Make Merry by Teleflora. I like the Beautiful in Blue arrangement. I’d love to have their Teleflora’s Sparkling Winter Wonderland bouquet in the middle of my table! They all are so beautiful that it’s hard to decide, I really liked the Send a Hug® Open Sleigh Ride. Thank you for the giveaway. I would love to try the Teleflora’s Sparkling Winter Wonderland! I love the Thomas Kinkade arrangement. I would love to be able to send these beautiful arrangements to my family. I like the Make Merry by Teleflora arrangement. I would like the Peanuts Christmas Mug. Thanks so much for your giveaway. I like the Make Merry arrangement! I would love the Thomas Kinkade’s Country Christmas Homecoming, so many nice ones though so hard to choose! I’d love to have the Snoopie Cookie Jar arrangement you have pictured here. It is adorable. I love that Peanuts Christmas Mug with arrangement in it too! The “Family Centerpiece for Christmas” would look good on my holiday buffet table. I like the make Merry arrangement. I also like the Peanuts Christmas mug. i’d like to try the PEANUTS® Christmas Mug. I love the By Golly, It’s Jolly arrangement. The Silver and Joy is my favorite. the Teleflora’s Mercury Glass Bowl Bouquet is what I would love to have delivered to me. My favourite Christmas arrangement is Teleflora’s Mercury Glass Bowl Bouquet. I love the silver and joy centerpiece, very pretty! The Snoopy Cookie Jar arrangement would be awesome! My mom is looking for a new cookie jar, and this would be perfect for the holidays! I would love to try the Teleflora Mercury Glass Bowl Bouquet. SO beautiful. I would love the Peanuts cookie jar one first then I would love the Peanuts mug floral set. I like the sparkling winter wonderland. I love the Snoopy cookie jar arrangement. I would sent it to my sister. My nephew is a huge Snoopy fan, so it would be a hit! I like the glass bowl bouquet. I also like the charlie brown mug. They have some nice floral arrangements. I would love the peanuts Christmas mug, because what’s better than coffee and flowers? I like the Candy Cane Christmas! i love the Peanuts Christmas mug! I want to get Snoopy’s Cookie Jar! So cute! I would pick the Snoopy’s Cookie Jar. I would choose this one because I absolutely have loved Peanuts since I was a child. It bring back happy memories of being a kid and it’s all about childhood innocence. I like the Christmas Wishes Centerpiece. http://www.teleflora.com/flower-arrangement/telefloras-sparkling-winter-wonderland/p_t15x400a?skuId=T15X400A I absolutely love this one !! The snoopy ones are adorable too. Thanks for this chance. I really like that floral arrangement with Snoopy! I would love the PEANUTS® Christmas Mug by Teleflora. I love coffee and I love Peanuts!! I would send my mother the Make Merry arrangement. I would love to try out the Thomas Kinkade’s Country Christmas Homecoming too! I visited Teleflora. I would like to try Teleflora’s Mercury Glass Bowl Bouquet! It is beautiful! Love Snoopy and think the idea of a cookie jar for after the flowers are gone is fab!! Would love to send this to my Mom for Christmas! They are all so pretty! Here’s one I’d love to have on my table: Teleflora’s Yuletide Spirit Bouquet. I LOVE the Deck the Halls Tree! So cute! my birthday is dec14 love awesome win..
i would love to definitely try caroling in the snow arrangement very beautiful and festive.